The Beazley House, Napa's first bed and breakfast inn. 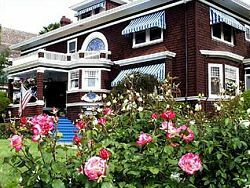 Opened in 1981 by Jim and Carol Beazley, this 1902 landmark maintains its turn of the century charm. Six of the Inns eleven rooms are in the Mansion, all with private baths and one with its own fireplace. 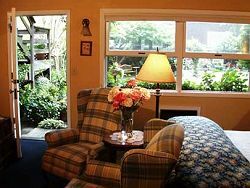 The remaining five rooms are located in the Carriage House nestled among gardens and manicured lawns. Each of the five spacious rooms reflects the "country" side of the inn, all have fireplaces and private two person Jacuzzis. Relax in our gardens were a splashing fountain is surrounded by blossoms and a meandering path. Enjoy our romantic swing that hangs from the huge 150 year old oak. Within a short stroll is old town Napa with its restored shopping area and gourmet restaurants. The Beazley House is centrally located to Napa Valley wineries and Sonoma wineries. No matter when you come, you'll find the Beazley House an inn for all seasons. Rates: $195-$375 Specials available for multi day stays, full breakfast included, Visa, MC.